Don Frye – UFC Hall of Fame and PRIDE FC icon – weighs in with a collection of his favorite fights from PRIDE. Don Frye vs. Yoshihiro Takayama PRIDE 21: Demolition Jun 23, 2002 (18:01) YOU MUST WATCH THIS WAR! 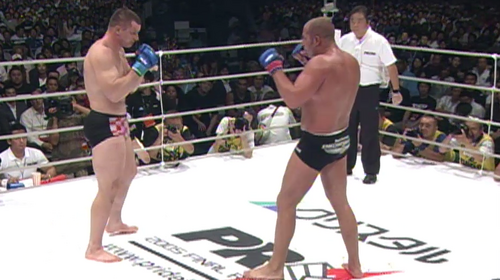 Arguably the wildest and most exciting bout in MMA history as famed Japanese pro wrestler Yoshihiro Takayama entered the PRIDE ring for an epic encounter with Don “The Predator” Frye, who was on an eight fight win streak. Don Frye vs. Ken Shamrock PRIDE 19: Bad Blood Feb 24, 2002 (23:18) One of the most heated rivalries in not just the history of Pride , but all of combat sports, these two hated rivals finally collided in the Pride ring in this February 2002 classic. 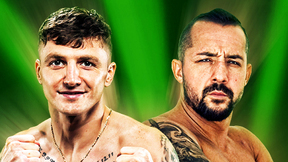 At the press conference three weeks before the fight, Frye taunted his enemy relentlessly and an enraged Shamrock had to be physically restrained. The fight itself, though, more than lived up to the hype. Mauricio Rua vs. Antonio Rogerio Nogueira PRIDE: Critical Countdown 2005 Jun 26, 2005 (22:24) In an epic encounter which won several “fight of the year” awards, Shogun and “Little Nog” waged war for the right to advance to the 2005 Pride Middleweight Grand Prix semi-finals. 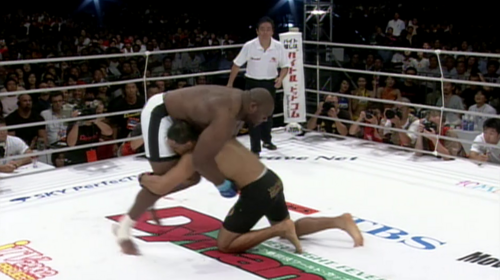 A graduate of the Pride Bushido circuit, Shogun was the most intimidating new talent in the world while Nogueira was coming off back-to-back wins over Dan Henderson and Alistair Overeem. Awesome! 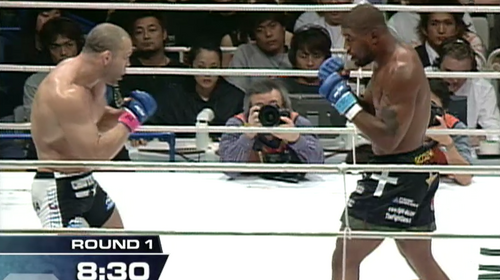 Wanderlei Silva vs. Rampage Jackson PRIDE 28: High Octane Oct 31, 2004 (15:33) On October 31, 2004, the two most powerful forces in Pride’s talent-laden middleweight division collided for the second time, as Wanderlei Silva sought to defend his world championship against bitter rival Rampage Jackson. 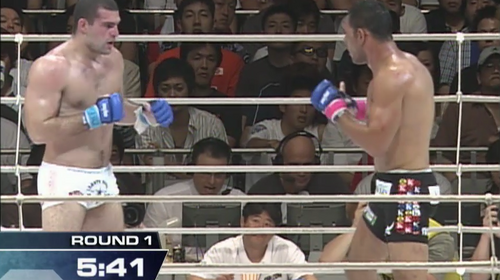 Minotauro Nogueira vs. Mirko Cro Cop PRIDE: Final Conflict 2003 Nov 9, 2003 (15:07) The November 9, 2003, battle for the interim Pride heavyweight championship was one of the most anticipated fights of the year. Fans couldn’t wait to see Minotauro Nogueira pit his BJJ submission skills and legendary toughness against the striking and terrifying knockout power of the undefeated Mirko Cro Cop. Takanori Gomi vs. Tatsuya Kawajiri PRIDE: Bushido 9 Sep 25, 2005 (12:16) Following one of the greatest lightweight scraps of all-time, “The Fireball Kid” Takanori Gomi entered the PRIDE 2005 Lightweight GP semifinals to face a former foe in Brazilian bomber Luiz “The Joker” Azeredo who owned 8 of his 10 wins via strikes. Nick Diaz vs. Takanori Gomi Pride 33 Feb 24, 2007 (9:53) This was the fight that signaled that Californian bad boy Nick Diaz truly was one of the greatest talents in the world. “The Fireball Kid” Gomi was the reigning Pride lightweight champion and widely considered one of the top three or four fighters in the world, pound-for-pound. 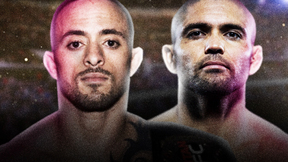 Gomi had lost just once in his last 14 fights, while Diaz entered the ring determined to prove his worth. Fedor Emelianenko vs. Mirko Cro Cop PRIDE: Final Conflict 2005 Aug 28, 2005 (23:43) Fedor’s detractors said the reigning champ had been “running” from Cro Cop but, finally, two of PRIDE's greatest ever heavyweights collided in this world title main event. Cro Cop was in the form of his life - and many predicted the title would change hands. Kazuyuki Fujita vs. Yoshihiro Takayama PRIDE 14: Clash of the Titans May 27, 2001 (23:07) Scoring wins in back-to-back PRIDE bouts, Japanese amateur wrestling standout Kazuyuki “Iron Head” Fujita with his 6-1 pro record was set to scrap with famed Japanese professional wrestler Yoshihiro Takayama who was making his MMA debut.